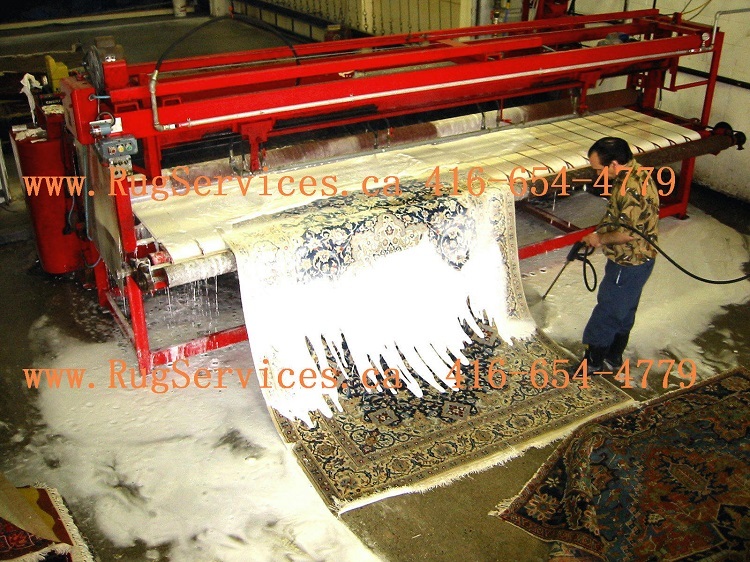 Persian & Oriental Rug Services Company is proud to provide the most reliable rug cleaning services in Oakville, Mississauga, Burlington, Etobicoke and Brampton. We provide services including Rug Cleaning, Rug Repairs, Rug Hand Washing, Rug Restoration, Color Damage, Fringes, Serging/Surging, Appraisal, Reweaving, Stain Removal, Moth Proofing, Deodorizing, Binding, Flood and Fire Damages, buy and sell. Our services cover all types of silk and wool hand-made Persian & Oriental Area Rugs. Our method of rug cleaning is a series of procedures starting with a thorough inspection of your rug before any cleaning procedures, followed by dry soil removal with high volume compressed air referred as Air Dusting. The cleaning procedure continues with a complete immersion and gentle bubble bath with compressed air for optimum soil removal. The final step is a thorough Rinsing that leaves us with clear rinse water. Repair, restoration, and preservation all require achieving the right blend of color, wool, and design accompanied by superb craftsmanship to match the look and the feel of the rug. Persian Rug Services takes the credit for being specialized in the art of repairing rugs. Stains may be a result of food or drink spilling, pet urine, light damage (fading) or water damage (color run). In the spilling or pet urine case, it is recommended to remove the spills immediately. The process of spot removal is to remove the stains by cleaning the rug first, if the stains are not completely remove, spot cleaning, Re-Dyeing, and Re-Weaving are the next steps. Rug underpad/under pad extends the life of your area rug by providing a smooth, supportive base in addition to preventing you from slipping and sliding on hard surfaces maintaining the placement of your area rug. How often should I have my rugs cleaned? Can pet stains be completely removed? How can I arrange for a Pickup? At Persian & Oriental Rug Services we are committed to respecting and protecting your privacy and want you to feel secure when visiting and providing information to us.